Electro Empire, the longest established online community for the international Electrofunk, Miami Bass and Technobreaks music scene, presents the second installment of it's in-house publishing company, a sub label of Germany's Dominance Electricity imprint. The vital production by the british E.P.G. aka Electro Pulse Generators is a hymn to the classic Electro genre. 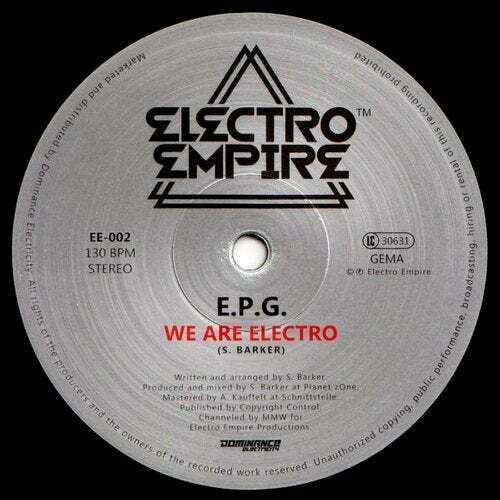 Traditional instrumentation and inspirations from legendary acts such as The Jonzun Crew, Newcleus or The Egyptian Lover aside, "We Are Electro" is much more than just another 80s tribute jam. Loaded with analog synths, 808 drum sounds and Vocoder vocals it carries enough musical depth and originality to become a classic in it's own right. THIS is Electro!